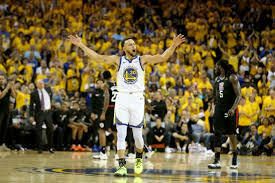 OAKLAND —The Golden State Warriors’ quest to become the first NBA team to score a three-peat in 17 years began with a rocking start as they took Game 1 against the Los Angeles Clippers, 121-104. on Saturday at the Oracle Arena. The Clippers, seeded eighth in the Western Conference, were actually the last team to eliminate the Warriors in the playoffs five years ago, but this time, they were overpowered by the three-time defending champs and the top seed. Klay Thompson (12), Draymond Green (17) and Kevin Durant (23) all notched double-figures in points. But it was the marksmanship of Steph Curry that carried the day for Golden State. Curry finished with 38 points, hitting 11 of 16 field goals and 8-of-12 triples. He also swished 8-of-9 free throws and passed Ray Alllen for the most three- pointers made in playoffs history with 386. Even after the Clippers traded away their best player Tobias Harris to the Philadelphia Sixers, they still made the playoffs with a bunch of well-coached gritty players. Bench players, Montrezl Harrell, 26 points, and Lou Williams, 25 points, led the Clippers in scoring. With 4:41 left in the fourth quarter and the outcome virtually determined, Durant and Patrick Beverly were both ejected after they would not stop jawing at each other. Both were face-to-face on several occasions during the game.